Am I the only person who is bewildered by the amount of chewing gum left on the sidewalk? Not just on sidewalks, but on every possible pedestrian surface, New York City is speckled with thousands of round blotches, roughly the size of a silver dollar and ranging in color from light gray to black. These more or less permanent spots are remnants of masticated gum which has been discarded and then flattened, either by foot or by wheel. One of the most disgusting--if relatively minor--aesthetic aspects of urban life, gum pollution is to me one of the most mysterious. I mean, once you’ve had the frustrating and humiliating experience of stepping on still-sticky gum, how could you possibly let a chewed piece of your own fall naked to the cement? Considering the staggering quantity of this gum waste, it seems downright spooky that in the twenty-some years I have lived in the city I have never actually seen anyone spitting a piece of gum onto the ground. Not once. I can’t even picture it. (Do the perpetrators lean over and let the gum drop straight down from their mouths, or do they shoot it out like a pop gun? Do they deposit the wads surreptitiously into their hands before sending them earthward? Do they look both ways to see if anyone is watching?) And it’s not just me: No one I asked has ever seen gum-dumping either. Like most people, I have observed pedestrians doing many unforgivable things, including but not limited to: neglecting to pick up their dogs’ poop; spitting (the non-gum kind,); dropping lit cigarette butts, half-eaten foods or paper trash to the ground as they walk ; or even--less frequently, thank God--peeing against the side of a building. I mean, I am not an oblivious person. So why haven’t I seen these excreting gum-chewers? Sometimes I try to imagine unusual scenarios that could justify this particular breach of civilized behavior: An alcoholic, having fallen off the wagon, chews a stick of Doublemint to cover tell-tale breath when suddenly he sees his AA sponsor coming down the street and must ditch the evidence; a woman with sudden tooth pain is terrified that a piece of Trident Sugarless is pulling out her brand new filling and so impulsively expels the offending substance; an adolescent confronted by a ragged stranger lets loose his Bubblicious to ward him off. The thing is, you would think I could find someone who has personally witnessed the commission of this litter crime. I suppose if I really want to solve this puzzle I am going to have to keep watch at odd hours. I may be able to discover bands of wild bubble gum gangs who come out only at 4:00 AM, chewing like mad and catapulting their gum all over the place. There is a possibility that over-zealous artists or graffitists are the culprits, for at least a portion of the gum splotches. 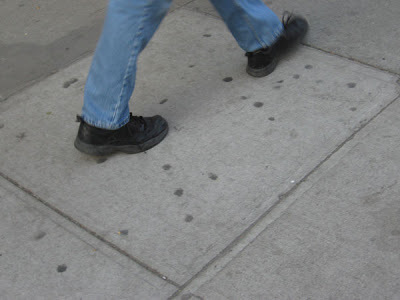 I have learned there are people (I found some on the internet, I’m not kidding) who simply love the look of sidewalk gum. One person has even made a Webgallery of photographs featuring blobs of squashed gum contrasted against different types of cement--kind of an ode to the urban polka-dot. This is brilliant. I'd never thought about this, perhaps because you don't see much "gumption" in Los Angeles. But you do see shoes. Specifically, you see one shoe left in the road, and I always wonder how it got there. A sandal, a bootie, a shootie, one running shoe - to show,yes - that the person moved at high speed. Fleeing someone, chasing after something, flinging a shoe off in disgust? There's a sadness to this because if you reach home with only one shoe left, a serious event has occurred. The road here is longer and wider than in New York - perhaps nobody has time for gum. Hmm. How interesting. The one-shoe thing seems not just sad, but a little scary too. How perfect, in a way, for Hollywood. A little horror-movie business everywhere you look!